Many women know all too well how it feels to try to accomplish the suffocating expectation of succeeding as a full-time professional while also being a full-time mom. They know the true meaning of catching conference calls on the way to soccer practice and trying to answer emails after they’ve cleaned the house and read a bedtime story five times over. They know the reality is that society, and often family structure, still designates the bulk of household responsibilities to the mother, no matter how hard she works outside the home to succeed professionally. They know this reality all too well, and that’s why it needs to change. The concept of second-shift motherhood is not a new idea, and unfortunately is not changing as rapidly as it should. The household and parenting duties are still vastly disproportionate between men and women, regardless of the fact that women are now racing toward the same professional career capabilities as men. The current situation not only puts stress and motherly guilt on the shoulders of many women, but prohibits them from the same success in the professional world. The structure of the family and the roles that women assume in the household translate directly into the workforce and into the way that women are treated as a whole. These are not two isolated variables. When women went to work, there should have been a dramatic social change in the home as well. It was a revolution that never was able to reach a full-circle change of equality. Women went to work, and were earning success in the career world, yet were still expected to have the same responsibilities that they had at home when they were not working. Therefore, the expectation is that women should be able to now advance in the workplace as rapidly and efficiently as men, while still having the duties of a stay-at-home mother. Roughly 63% of working mothers agree with the statement “Sometimes I feel like a married single mom.” A poll conducted in 2011 by Forbes Woman and The Bump sought to understand how women were feeling about their roles in the household and in their professional lives. Several articles on Reuters.com and in Forbes magazine depict personal accounts and statistical survey results that support the dilemma of the Second Shift mother and how that concept is a modern day reality. “Eighty percent of the respondents work outside the home full-time, and roughly 44% bring in the majority (more than 50%) of the annual household income. Yet in all cases, working and SAHMs alike, the mothers reported that they are responsible for the majority of all ‘at-home’ work,” says Forbes. This issue also creates strain within marriages because it causes resentment and detachment from their spouses. Many answered that they felt they could never even get a break, but 97% stated that their partners could. Majority of surveyed mothers admitted they feel resentful toward their partner because of all they have to do. This kind of inequality that still exists within homes and marriages is harmful to the well-being of the family and the children who establish their own interpretation of gender from the portrayal of their parents. Real gender equality begins in the home. It is the examples set by parents and family members that children learn from and take with them into their own relationships and families. Female advancements toward occupational equality can be stunted by the slow changing gender roles and responsibilities that exist at home. Teaching young girls and boys that both parents can contribute to the home and allocate time for their professional lives equally is a strong part of the foundation for social change and for successful equality among genders. Allowing women to obtain the same opportunities for professional advancement is how we achieve equality in the workforce. This issue is one that needs to be addressed from many angles, both in practice and in the overall mindset of the traditional roles of the family. Most importantly, it needs to be addressed as an issue of importance by both men and women. 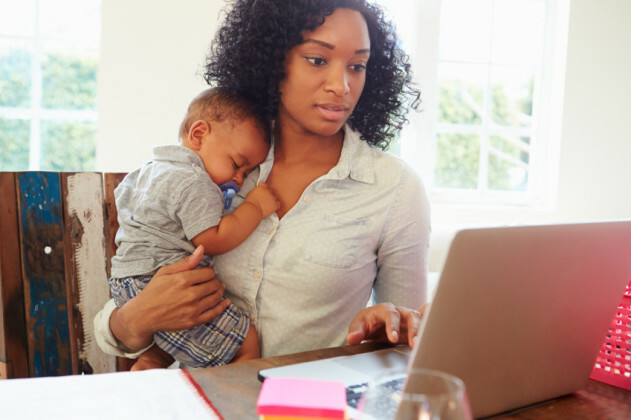 In the Forbes article, “Should Overwhelmed Working Women ‘Take It Like A Mom’ Or Ask For Help?” the question is posed as to whether or not women need to demand more of an equal contribution from their spouses. “Communicating the need for help is a troubling but necessary first step, TheBump.com CEO Carley Roney says, to relieving stress, avoiding resentment and—ultimately—getting the time out every mother deserves,” says Forbes. We want equality in the workforce, household, and in parental dynamics. We want a world where both daughters and sons can grow up knowing neither has more of a responsibility as a parent or professional due to their gender. We want equal opportunity to learn and grow as couples, families, and unique individuals. Women shouldn’t have to choose between being a full-time mom, full-time professional, or full-time exhausted individual caught between too many unfair expectations. Balance leads to harmony, and harmony leads to happiness. We deserve that happiness, as women and as a world. Lexi Herrick is a blogger, marketer, student, cat lady and hopeless romantic. Her work is featured on several online publications such as the Huffington Post and Elite Daily, and centers around the importance of universal equality, healthy relationships, body confidence, mental health and millennial generation topics. She has quite the affinity for new friends, so if you’re interested in reaching out to her or finding more articles, you can check out her blog here.